Tucked among the farms and factories of Eastern Pennsylvania, The Hotel Hershey and Hershey Lodge make it refreshingly easy for gluten-free families, couples and groups to have a truly carefree getaway this Valentine’s Day, and beyond. “Sweets for my sweets,” my grandfather would say, lovingly presenting my sisters and me with a bag of Hershey’s Kisses during his weekly visits. I suspect every family has their own sugarcoated Hershey’s memories—mine, however, may border on the obsessed. In addition to my grandfather’s treats, the theme of my very ‘90s bat mitzvah was candy (my ever-gracious mom created a Hershey’s stencil and used brown spray paint to make oversized candy bar centerpieces; guests received cylindrical Hershey’s-emblazoned piggy banks as favors); for my eighth-grade woodshop class, I created a clock in the shape of a Hershey’s Kiss (my best friend made hers in the more class-appropriate shape of a hand saw); and at a party before my wedding, friends showered my husband and me in foil-wrapped Kisses, wishing us sweetness ahead. So it was with great relief that, after my daughter and I were diagnosed with celiac disease in 2014, I realized just how many Hershey’s products we could still safely eat. Because, sure, I quickly got on board with sorghum and quinoa and spiralized-everything, but when my sweet tooth kicks in, nothing satisfies those chocolate cravings quite like Hershey’s. And when, last Christmas, my family headed to The Hotel Hershey (what took a devotee like me so long to make the pilgrimage, I’m not sure…), I was blown away by the resort’s ability to accommodate my family’s gluten-free needs: For the first time since our diagnoses, we didn’t even touch our go-to bag of on-the-road gluten-free food. 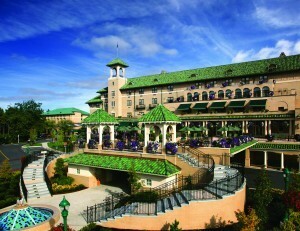 From room service to poolside dining to meals at the hotel’s upscale restaurants and the nearby Hershey Lodge’s family-friendly ones, servers and chefs were knowledgeable, reassuring and encouraging—making “The Sweetest Place On Earth” also one of the most relaxing for gluten-free guests. I’ve grown accustomed to feeling like an intruder at cramped, snooty city spas, so I had a moment of welcome culture shock upon being greeted at The Spa At The Hotel Hershey. Ornate and spacious without being at all pretentious, the spa occupies three floors at the far end of the grand resort. There’s an aromatherapy room, a tranquil silent room and a lounge designed in the image of company founder Milton S. Hershey’s library, overlooking the Hotel’s sprawling grounds; there, I snacked on Kisses and sipped coffee while waiting for my treatment with fellow robe-clad singles, mother-daughter duos and couples. The spa’s signature Cocoa Massage was a gentle, Swedish-style treatment that made use of lightly scented—gluten-free—massage oil. With an unobstructed view of the nearby roller coasters, the brand-new Butterfly Atrium inside Hershey Gardens features hundreds of majestic butterflies, including rare species from Africa, Asia, and Central and South America. Look up as you exit the exhibit into the Milton and Catherine Hershey Conservatory to see stunning stained-glass butterfly mobiles created by local artist Luise Christensen-Howell. Fun fact: It seems even the butterflies have gone gluten free—they feast on fruit and juice. The exhibit is open year-round and kept between 78 and 82 degrees, making it a decidedly appealing wintertime excursion. I was married at a botanical garden and, in college, even toyed with the idea of majoring in horticulture; flowers speak to my inner hippie. Eighty years ago, Milton S. Hershey wanted to “create a nice garden of roses,” and today, the 23-acre attraction—open year-round—doesn’t disappoint. We especially loved the playful children’s garden, with its interactive musical features and alphabet-themed walkway, and the peaceful Japanese garden with its massive sequoias and babbling stream. Back at the Lodge, my kids went bananas at the indoor pool complex that opened last May. We took turns jumping on Reese’s Peanut Butter Cup-shaped “lily pads,” “riding” (foam) dolphins, and slipping and sliding on a structure designed to look like a giant sand castle. At the poolside Cocoa Cabana—where the chef and manager had both received allergen-safety training—our family enjoyed salads, sandwiches and the first soft-serve ice cream we’ve had since our celiac diagnoses; the Cabana’s manager and chef reassured us that all flavors were gluten free and had zero contact with cones. The Water Works facility also includes a gym, candy-themed playroom and LEGO zone, and arcade. Kitschy Coney Island notwithstanding, I’ve never been much of an amusement park gal. But in Hershey, I stumbled upon two secrets for making the most of the park. The first strategy: Visit in winter, when the crowds are relatively non-existent! The second: Arrive later in the day (free shuttles run from both The Lodge and the Hotel), and do the free Hershey’s Chocolate World Tour first (it’s a cute 15-minute ride through a mock Hershey “factory”). Then make your way over to the park and get discounted “twilight” tickets for late-day entry. You’ll arrive just in time to check out the 200 animals at ZooAmerica before stopping at The Outpost, the park’s dedicated allergen-friendly vendor for pizza, salads, sandwiches, snacks and more. I was oblivious to the extent of Milton S. Hershey’s philanthropy until visiting this thoughtfully curated museum. It offers an interactive look at how Hershey went from bankruptcy to mega-success, with a touching focus on the impact of the Milton Hershey School. Hershey founded it for children from impoverished backgrounds—and donated his entire personal fortune to it. Our kids loved “working” the factory machines and creating digital faux newspaper front pages with their faces on them (a nod to Hershey’s namesake Hershey Press newspaper) while my husband and I were impressed with the collection of candy memorabilia dating back to the late 1800s. I admit, I rolled my eyes when I saw it on the daily activity list. But the hilarious and high-energy Hershey staff turns the classic game into a spirited competition where everyone is a winner. My preschool-aged son has never been prouder than when, during the last round of the night, he unabashedly shouted “BINGOOOOOO!” before collecting his chocolate bounty. The Hotel has three upscale restaurants…which I would’ve made reservations for had I been traveling without kids. That said, sometimes the greatest indulgences for even an adult traveler are the guilty little pleasures you typically can’t have outside of your home when you’re eating gluten free—for us, that included the grilled cheese with house-made bacon off the kids’ menu at Harvest, with baked French fries to boot. The more laidback Lodge has four restaurants—all more casual than those at the Hotel—in addition to The Lobby Bar, coffee shop, Cocoa Cabana and room service. Our kids loved the hockey-themed Bears’ Den, with its memorabilia from the local minor league Hershey Bears team. Chef Felicia Griffie personally came out to reassure us that, with few exceptions, pretty much anything on the menu could be adapted for our needs (they even have a dedicated gluten-free fryer—yay!). Of course, you could easily spend the weekend surviving on the properties’ strategically placed candy bowls. There are also two 18-hole golf courses for overnight hotel guests’ use at Hershey Country Club, mini golf, weekend falconry, 5.5 miles of hiking trails, a playground, outdoor pools, tennis and basketball courts, and kids’ activities like scavenger hunts and opportunities to meet Hershey’s characters. And seasonal events, like Hershey Sweet Lights, a drive-through Christmas lights show, “Chocolate-Covered February” for Valentine’s Day (think chocolate-and-wine pairing events, savory chocolate dishes and more), attract visitors of all ages from all over. Jessica Press is a writer whose work appears in Redbook, Parents, O, The Oprah Magazine and more.